The SVP Society is an international Christian voluntary organisation dedicated to tackling poverty and disadvantage by providing direct practical assistance to anyone in need. "Helping make a difference...!" Are held on the 3rd Wednesday of each month. At Our Lady of Mount Carmel Parish Centre at 8 p.m.
All interested in volunteering are very welcome. - Speak to your priest or Deacon Peter who will put you in touch with an SVP member. I was drawn to our SVP by the request for supporting the ‘The Basement Project’ for young needy people in Bromsgrove which I continue to be regularly involved with. At Our Lady of Mount Carmel, I have seen people, on going into church, put toiletries and food in the collection boxes for the Christmas shelter. 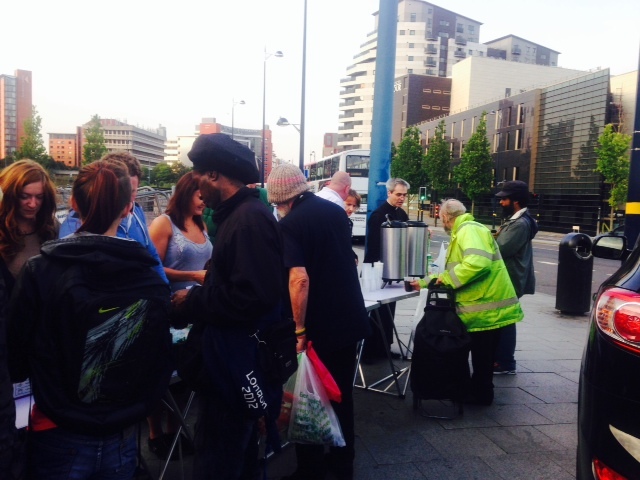 I saw others respond to the invitation from SVP to help with getting food to the homeless in Birmingham City Centre. For me these invitations , coming from the SVP, are special as they not only remind us all that we can all help make a difference to the lives of our sisters and brothers in Christ but they show us ways we can do this. The generous lead from SVP members is a power for good. That is the big picture, now for a little detail looking at one life. As a member of the SVP I regularly support a parishioner by giving her lifts to the weekly Vigil Mass and going with her afterwards for a cup of tea at the Parish Centre. Here she and I have been made very welcome and this is now a part of her social calendar. I have followed the lead of another more experienced SVP member and have supported this lady with her difficulties in operating as an independent adult. I am delighted to report that she has met more people at the church and goes out more. When I first met her she was new to Redditch, new to widowhood, feeling alone in the world, frightened and overwhelmed. She is now settled in her home, she is being taken out now and again, she knows she will be taken to Mass, she knows that she matters. This lady is very grateful for all that SVP and the priests have done for her - in her turn she prays for us and has given to SVP food and toiletry collections. SVP members have been a catalyst for bringing about improvements to her life. People who are in emotional or financial crisis are often short of food, fuel, clothes, furniture and support. Your donations really do help us to help them. Donating your time - no matter how short - can really make a difference! SVP volunteers are currently working with needy people within the Mount Carmel Parish, Bromsgrove area and in Birmingham. Do you think you could contribute in any way? 25 Volunteers from the Parish and other Parish Groups came to make 400 sandwiches for the next 2 weeks to keep the Soup Kitchen going in Birmingham. The Headteacher of Holy Souls Catholic Primary School in Birmingham Kevin Kelly invited Steve to their Advent assembly where he presented a cheque for £1000 for our Parish SVP. This money will go towards the costs of the Christmas lunch and party the SVP have arranged for 200 homeless men and women in Birmingham on Saturday 19 December. 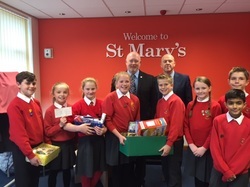 The children and staff at St. Mary's Catholic primary school in Studley donated lots of food items from their harvest festival appeal and £336 towards the SVP Christmas Party on Saturday 19th December in Birmingham. Help in the garden and basic DIY. Providing Lifts to Mass. Please contact the SVP if you would like help in getting to Mass at the weekend. If you feel that you are able to offer regular lifts to Mass to those who are struggling, please contact us. Do you think you could help us in this kind of work? We would love to recruit new members with ideas on how to help people in the Redditch area. Financial donations can be made in the 'hole in the wall' at the back of Mount Carmel, or by contacting a member of the SVP. Schools in Redditch, Birmingham, Alcester and Studley help us to raise money for the work we carry out. The talks we give about homelessness fit into their school curriculum and help develop awareness of the problems and how they can help. Children and young adults from our Parish schools are involved in the Soup kitchen and Outreach projects and are really ‘making a difference’. In this photograph pupils from St Bede's Middle School make sandwiches for the homeless. Staff and students from St Augustine's High School and St Bede's are regular volunteers. We provide and recruit volunteers for The Soup Kitchen (4th Tuesday and 2nd Friday evenings each month), and Outreach (2nd & 4th Thursday evenings each month). We regularly provide food and clothing, as well as a friendly word, for around 100 of the homeless and destitute in Birmingham. Homeless and needy people queue up to receive soup, sandwiches, hot drinks and food. Some Polish parishioners help to break down language barriers. A Christmas Party was organized for over 200 homeless men and women. They had a present bag, items of clothing, toiletries and a call to relatives from a free mobile phone arranged by LoveBrum. THANK YOU so much for your support with food, clothing and other donations . Other faith groups and 6 more SVP groups carry out this work on other evenings so that every night of the year is covered. Or course, ﻿helping alleviate their hardship brings its own rewards. As well as that, our Outreach group seeks to help and comfort those we find sleeping rough on the streets of Birmingham, supplying Vinnie packs, sleeping bags, simple food and basic clothing and sanitary needs when required. 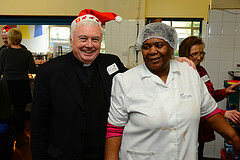 Our SVP helped organise, finance and staff this event for many homeless and poor people in Birmingham. SVP members and others meet outside Westminster Cathedral. SVP Fact-finding Party meet His Eminence Cardinal Vincent Nicholls in London on March 20th, 2015. They went with Monsignor Pat Browne, Monsignor Michael White, Phil Yates, Lisa Dawson and Ben Rafiqui - all interested in setting up proper facilities for the Homeless and needy of Birmingham and district. The group went to meet Lorraine from 'The Passage' where they spent over an hour hearing about their wonderful practical and holistic approach to help those most in need. Amazingly and sadly they have an average of 150, mostly men, visiting them each day for help and assistance. With 33 years experience the service they offer is beautifully tailored to get the best outcomes for the people seeking their support. They next went to the Basil Hume Centre to meet Hilary where they were told about its work with early intervention, prevention and helping younger clients and families. Their centre is a maze of child care, classes, flat lets, hostel, workrooms etc and offers clients a range of support to independent living and getting their lives back on track. At the Cathedral the group met Alistair who is Projects Director for Housing Justice. Lastly, His Eminence Cardinal Vincent Nicholls met them all at the Archbishops House where they talked about the work done as an SVP and the wider group in Birmingham. He shared the parable of the Good Samaritan with the group who went home where they hope to use the knowledge gained to help set up help for the homeless in Birmingham. Birmingham Outreach 2014 - "Archbishop serves homeless at city centre soup kitchen"
The Archbishop of Birmingham, the Most Reverend Bernard Longley helped volunteers from the St Vincent de Paul Society (a charity dedicated to tackling poverty and disadvantage) to distribute sandwiches and hot drinks at a Birmingham City Centre Soup Kitchen at the weekend. The Kitchen is open every night of the year to offer practical assistance and support to anyone who walks through its doors - between 70 and 140 homeless men and women visit the Soup Kitchen every night. 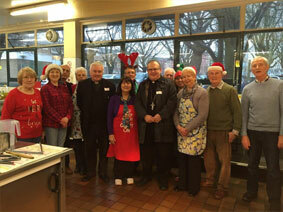 The Redditch St Vincent de Paul Society (SVP) supports the Soup Kitchen twice a month. Up to 12 volunteers from this local group help distribute sandwiches and hot drinks; sleeping bags, clothing and footwear to all those in need. Polish parishioners from Our Lady of Mount Carmel Catholic church regularly join the volunteering team to reach out to the many Polish and East European men who visit the Soup Kitchen. This local group also has volunteers who bi-monthly walk the streets of Birmingham city centre seeking out men and women living in car parks; stairwells, doorways etc. who, for whatever reason, cannot - or choose not to - visit the Soup Kitchen. The volunteers travel armed with sandwiches, hot drinks, sleeping bags, basic clothing, ‘Vinnie-packs’ (which includes toiletries, hat, gloves, socks and a thermal blanket) and a sympathetic ear. The group is supported by a network of four parish schools – one of which - St Bede’s Middle School - has volunteered to make the 300 sandwiches needed for each Soup Kitchen for the next few months. The money to buy the ingredients comes from the many donations - both large and small – the Redditch St Vincent de Paul Society receives from generous benefactors – individuals and organisations, including significant contributions from AT&T. 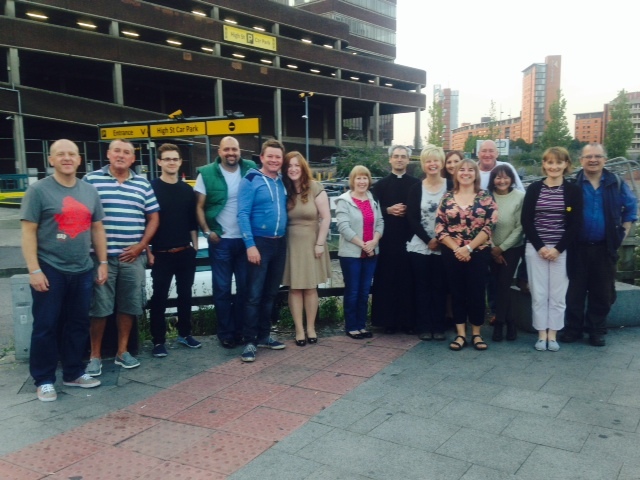 Archbishop Bernard Longley said: “I was immensely grateful that I was able to join the members of the St Vincent de Paul Society last night at the Soup Kitchen venue at Moor Street in central Birmingham. I was very struck by the large number of people who came looking for help and by the wide range of needs that brought them there. The presence of these men and women night by night highlights the scandal of poverty in the heart of Birmingham and the responsibility that we all have not only to alleviate but to seek to prevent it. One of the volunteers, Mrs Anne Glennon, added: ‘‘I responded to an appeal by our Parish SVP group for volunteers to help at a Soup Kitchen. I didn’t really know what to expect as we drove in to Birmingham city centre. On arriving we were met by over 100 men and women. They were desperate for the food and drinks we had with us. I could not believe that in this day and age so many people were so dependent on a Soup Kitchen in this country’s second city”.